1. Take your kid’s picture at the start of the day. You can read why here. 2. Ditch the bulky purse. This tip comes from my wife and oldest daughter. This year my wife opted for the smallest purse she had to carry just the essentials. My daughter went with a draw sting bag/backpack. 3. Wear comfortable shoes. Yes, it’s Summer. Yes, it’s hot… but you’ll be walking and standing a lot. Your flip flops won’t cut it. 4. Wear shorts and light colored shirts. Even if you don’t think you look good in shorts go ahead and wear them. No one cares what you look like. 5. Eat a good breakfast. It’ll make a good base for all the high fat and calorie foods you’ll consume throughout the day. 6. Drink lots of water! Buy a bottle of water at the start of the day and then fill it up every time you pass a drinking fountain. It’ll save you money and keep you hydrated. 7. Wear sunscreen. This is one tip I’ve seen people forget and they end up looking like a lobster by the end of the day. 8. Check the fair’s website for things that might interest you. My girls love looking at the homemade doll houses. I like the photography. We all love watching the sheep dogs and cutting horses. 9. Bring hand sanitizer. There are lots of “hands on” activities. This could help keep you from getting sick. 10. Get your hand stamped on the way out even if you don’t plan on going back. You never know what could happen. Plans might change or you could have car troubles. This way you could at least get back into the fair instead of having to wait in the parking lot. 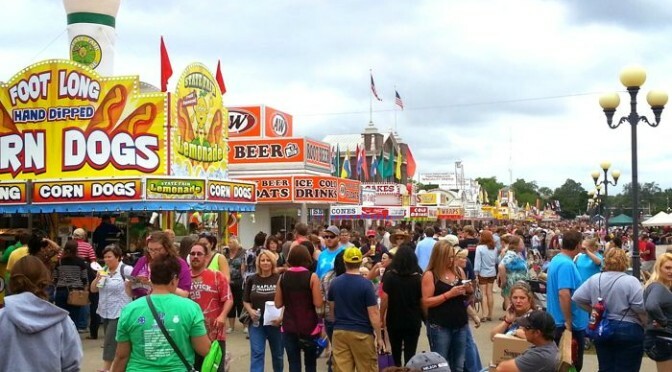 What are your best Iowa State Fair tips? Leave a comment and let me know. Great tips Tony! I’ll definitely keep these in mind for when our fair rolls around in a few weeks. Thanks, Chris! I look forward to hearing about your state fair! Good point about walking through the livestock areas! I hadn’t thought of that. They have lots of free activities and contests and performances and the food is great! Plus, Grandfather’s barn is nearby where adults can sample some wine. As a bonus, the fair museum has a big front porch with rocking chairs and benches that you can rest in and just enjoy the best view on the fairgrounds. Having worked at Grandfather’s barn back in the day when I was in FFA in high school, the top of the hill is a place I never miss! I am surprised that more don’t venture up there. Great tips, Marsha! You’ve definitely made me want to venture up the hill this year.